Do you want to talk to us? We want to talk to you! 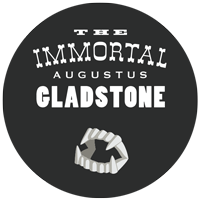 So come spend some time with us during our live screening of The Immortal Augustus Gladstone this Monday, Feb. 24th, at 7:00pst. Writer/Director Robyn Miller (me) and Producer Mischa Jakupcak will be on hand to answer (via audio) your questions during the show. This is how it works: we’ll all be watching the film together, you ask the questions, any questions, whatever you like, and we’ll be sitting in front of a couple of (super high fidelity) microphones in our (super high fidelity) studio, and we will pretend to be sophisticated and worldly… and a little snobby. We’ll kind of provide a running commentary. By the way, the screening is FREE, or whatever you decide to give. But you can still get your tickets now.